The world is reacting to the passing of former First Lady Nancy Reagan. "Nancy Reagan once wrote that nothing could prepare you for living in the White House. She was right, of course. But we had a head start, because we were fortunate to benefit from her proud example, and her warm and generous advice. Our former first lady redefined the role in her time here. Later, in her long goodbye with President Reagan, she became a voice on behalf of millions of families going through the depleting, aching reality of Alzheimer's, and took on a new role, as advocate, on behalf of treatments that hold the potential and the promise to improve and save lives. We offer our sincere condolences to their children, Patti, Ron, and Michael, and to their grandchildren. And we remain grateful for Nancy Reagan's life, thankful for her guidance, and prayerful that she and her beloved husband are together again." "With the passing of Nancy Reagan, we say a final goodbye to the days of Ronald Reagan. With charm, grace, and a passion for America, this couple reminded us of the greatness and the endurance of the American experiment. Some underestimate the influence of a First Lady but from Martha and Abigail through Nancy and beyond, these women have shaped policy, strengthened resolve, and drawn on our better angels. God and Ronnie have finally welcomed a choice soul home." "Nancy Reagan was one of my heroes. She served as First Lady with unbelievable power, class and grace and left her mark on the world. She's with her Ronnie now, but those of us she left behind will miss her dearly." "Nancy Reagan was totally devoted to President Reagan, and we take comfort that they will be reunited once more. George and I send our prayers and condolences to her family." "Nancy Reagan will be remembered for her deep passion for this nation and love for her husband, Ronald. The Reagan family is in our prayers." "Nancy Reagan, the wife of a truly great President, was an amazing woman. She will be missed!" "Laura and I are saddened by the loss of former first lady Nancy Reagan. Mrs. Reagan was fiercely loyal to her beloved husband, and that devotion was matched only by her devotion to our country. Her influence on the White House was complete and lasting. During her time as first lady and since, she raised awareness about drug abuse and breast cancer. When we moved into the White House, we benefited from her work to make those historic rooms beautiful. Laura and I are grateful for the life of Nancy Reagan, and we send our condolences to the entire Reagan family." "Nancy Reagan embodied what it means to represent America as first lady and her dignified and warm demeanor inspired America. Mrs. Reagan will go down in history as a woman who left her own mark on the White House and our country. She was a longtime friend and supporter of many in our party, and will be sorely missed." "President Reagan has been reunited with his wife and partner but America and the Reagan family have lost a woman of grace and strength. I join people from around the country and the world in sending them our best thoughts and prayers during this difficult time. A woman of strength and wit, Nancy Reagan's dedication to our country was matched only by that of her husband. Theirs was one of our nation's great love stories and a model of shared devotion to our country. America is stronger and better for their service." "Mrs. Reagan understood the enormous responsibility that comes with representing our nation from the White House on the world stage, and she was beloved by the American people for her grace and dignity in that role. Her 'Just Say No' campaign to keep children from abusing drugs had a long-lasting impact that no doubt saved lives. And her work later in life to support the National Alzheimer's Association and stem cell research helped advance the science of finding a cure for a devastating disease that affects millions of American families every day." "Nancy was an extraordinary woman: a gracious first lady, proud mother and devoted wife to President Reagan - her Ronnie. Her strength of character was legendary, particularly when tested by the attempted assassination of the president, and throughout his battle with Alzheimer's. She leaves a remarkable legacy of good." "Today our nation mourns the loss of Nancy Reagan, a true example of integrity and grace. My prayers are with the entire Reagan family." 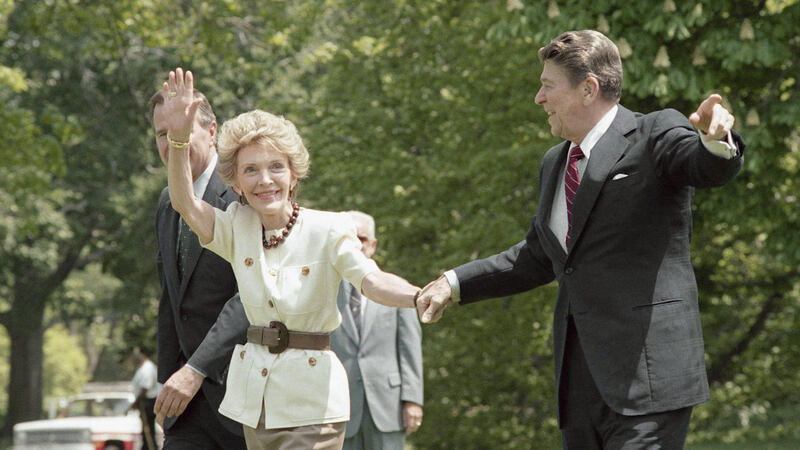 "I remember Nancy as a noble woman who supported President Reagan and stood by his side. She will be remembered as a great friend of the State of Israel." "For Ronald Reagan, and in many respects for the country during his administration, she was our own Iron Lady. She was really the person behind President Reagan that gave him his strength and his security and his love. You know, she was everything to Ronald Reagan. I think our nation owes her a debt of gratitude because of the extraordinary support that she was able to give the president during his entire time in office." DEMOCRATIC CALIFORNIA GOVERNOR EDMUND G. BROWN JR.
"Nancy Reagan lived a remarkable life and will be remembered for her strength and grace. On behalf of all Californians, Anne and I extend our deepest condolences to the Reagan family." "Nancy Reagan was an exemplary first lady. Even after her time in the White House, she was an outspoken advocate for stem-cell research to find a cure for Alzheimer's Nancy Reagan had a god heart, and she will be dearly missed." Nancy Reagan was one half of the team that restored our nation's pride and confidence in itself, and reinvigorated America's leadership role in the world. She was her husband's closest advisor, his constant protector, and most importantly the love of his life. She was indispensable to his success. Theirs was an extraordinarily beautiful love story. America and the world are better places today because of Ronald and Nancy Reagan. Susan and I have the entire Reagan family in our hearts and prayers.